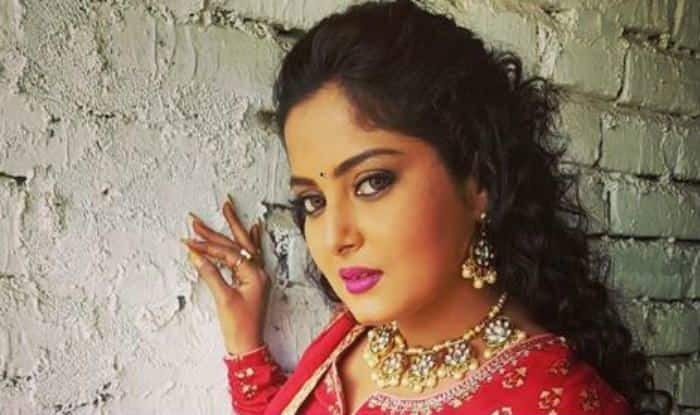 Bhojpuri item dancer Anjana Singh is known for her killer dance moves. Her dance numbers instantly go viral on the internet. Now, she took to Instagram to share a video where she is seen crooning and grooving to a Bollywood number ‘Agar Yeh Pyaar Ho Jaye’. Dressed in a black tank top, she has teamed up her look in a bright orange blazer and short skirt. She has accessorised her look with subtle makeup, pair of earring and kohled eyes. As per the video, it seems like she was on the sets of her shoot when she took out some time and made this video. Anjana Singh, who has worked in several movies and has featured danced to many item songs, made her debut with Ek Aur Faulad. She bagged the Best Actress Award for Nazar at the fourth International Bhojpuri Film Awards which was held in Malaysia on July 21. Anjana has featured in 3 movies this year such as Nagraj, Badrinath and Sanki Daroga opposite Bhojpuri power star Ravi Kishan. Besides being a popular actress, Anjana is also a social media sensation and has a crazy fan following on all sorts of social media platforms such as Twitter and Instagram, among others. The glamorous star is also an amazing dancer with her dance videos and item songs crossing millions of views on video-sharing app YouTube. Anjana is famous for her performances in Bhojpuri films such as Tuhi To Meri Jan Hai Radha, Raja Ji I Love You, Dil Lagal Duppata Wali Se, Karela KLamal Dhartiu Ke Lal, Ballia Ke Dabangai, Ham Se Badh Kar Kaun and Hero Gamcha Wala, among many others.